I have divided the transistor designs into two ‘eras’. 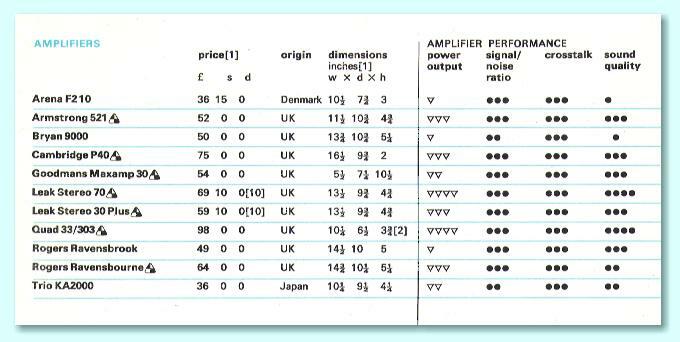 This page looks at the ‘Germanium Transistor Era’ and covers the 400 and 500 ranges which used germanium transistors in the output stages of their power amplifier sections. Note that all the magazines and books referred to below were United Kingdom publications unless otherwise specified. In some cases I don’t know the exact date of publication because I only have a reprint that omits the date. I indicate these with a “?” mark. The last valve units that Armstrong designed were the 200 range and its associated 100 range. The 100 range units were essentially the same as the 200’s. However their power amps omitted an output valve to make them cheaper to manufacture so they could be sold at a lower price. In later decades some Hi Fi enthusiasts have come to regard “single ended” valve power amps as being the designs that deliver the highest possible sound quality. It is a curious quirk of history that an approach that was once seen as a cheaper and poorer arrangement is now sometimes sold at high prices as providing the ultimate in quality! There never was an Armstrong 300 range. Their first all-transistor range of units were the 400’s. The 400, 500, (and 600) ranges were all ‘modular’. i.e. The tuner-amplifier units (receivers) used the same amplifier and tuner circuit boards as were sold separately in the stand-alone tuners and amplifiers. 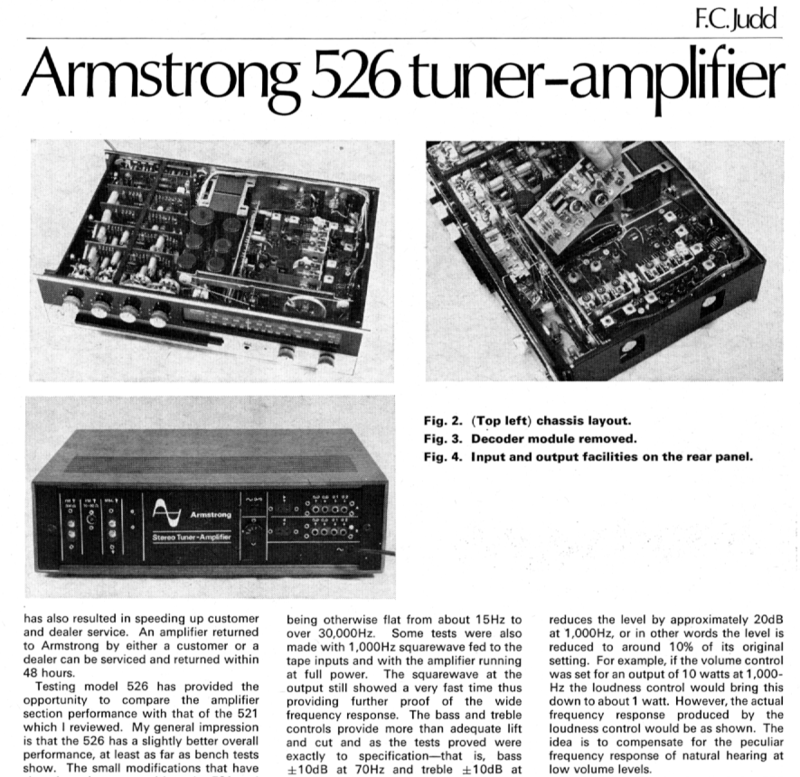 As a result, Armstrong tended to send an AM/FM receiver (tuner-amplifier) for reviews unless the magazine specifically requested a tuner or am amplifier to test. The output devices in particular were selected germanium AL102’s. At that time the variations between individual examples of a given type of transistor were often far greater than today. The devices were also much less robust than modern silicon transistors. Hence the devices needed to be individually tested and selected. By modern standards, these devices were virtually ‘hand made’. Measurements made by the reviewer during his tests showed that the 426 met the specifications published by Armstrong. Unfortunately, the 400 range units didn’t sell very well. From feedback at the time Armstrong felt this was for two reasons. 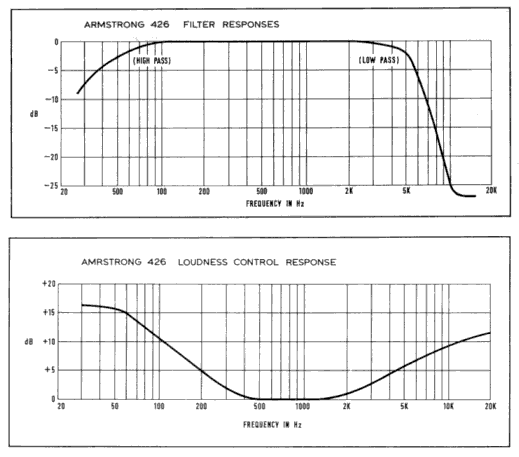 Firstly, in their adverts and publicity material Armstrong tended to simply describe the 400’s amplifier as rated at “15 Watts per channel, 4 to 16 Ohm loads”. However other makers at the time had begun advertising higher powers by being more selective about the loudspeaker load specified. In fact the 400 could deliver around 25 Watts into 8 Ohm loads. As a result, the initial advertising tended to present a unfair impression when readers simply compared adverts in terms of the ‘rated power’ because the values were given on a different basis. “Forty years on! Yes, it is that period of time since the first Armstrong radio receivers were produced and over this span the Armstrong organisation has deservedly built up a reputation for good performance allied to exceptional value for outlay. Now comes their latest 500 series of units, which can only enhance their established name. This new range covers amplifiers, FM tuners, AM tuners and Tuner-AmpIifiers, but, whatever the configuration, each uses the amplifier of the Model 521 which is the subject of this review. The measured results obtained were in line with other reviews. 1970 April “Which” – A large survey of stereo equipment including the 521 Amplifier. The 1970 review of Hi Fi equipment in “Which?” magazine turned out to be a very significant event for Armstrong. Sales of the 500 range were already fairly healthy by this point. But the effect of this publication was to lift the demand for Armstrong equipment though the roof! For those who are unfamiliar with “Which?” it is worth making a few points about the magazine. It was produced by an independent body called the Consumer Association (CA). Member of the public interested in consumer goods could join the CA, and in return would get the magazine. Its approach to reviews was different to most commercial magazines. Usually, a magazine would request items for review direct from the manufacturer. However “Which?” would buy the items in retail shops anonymously. This was to ensure they did not get equipment that might have been given special treatment by the maker. Also, “Which?” tended to carry our ‘surveys’ that tested and compared many competing units. The magazine then presented the results in terms designed to be understandable by a general audience with no previous knowledge or expertise. 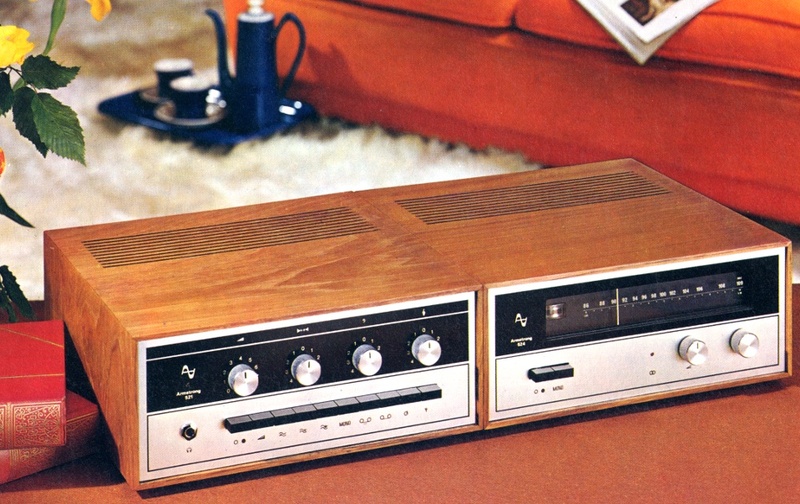 The survey in the April 970 issue actually covered amplifiers, tuners, loudspeakers, and the other items that members of the public might buy as ‘separates’ to combine into a complete home ‘stereo’ or Hi-Fi system. The result tended to be lists or tables of models which gave ratings in a format which were often described as “the more blobs the better!” These were then followed by picking out some models as “best buys”. Readers of the magazine could simply look for the units that had “the most blobs” in the charts and were mentioned as a “best buy” without needing to understand the technical tests or their measured results. At that time Armstrong had established a reputation for being swift at fixing any faults. This was aided by the plug-in cards used for the electronics in the 500 (and previous 400) range. Most faults or problems could be dealt with quickly by simply removing a faulty board and plugging in a working replacement. Armstrong retailers were happy to accept sets to send back for repair. But customers who could get to Holloway in London soon realised that if they had a problem with a 500 range set they could bring it to the factory and it was often repairable whilst they went and had a cup of tea! One result of this was that those who worked at Armstrong became used to customers walking down the road and into the factory, carrying their precious item. And the brief recommendations at the end of the survey featured the 521. At that time “Which?” was sent out to over 600,000 subscribers. Copies would also have gone to many public libraries, and its content tended to be picked up by newspapers and broadcasting. So what was said in the survey would have reached a far wider audience than a review in a specialist magazine for Hi Fi enthusiasts. 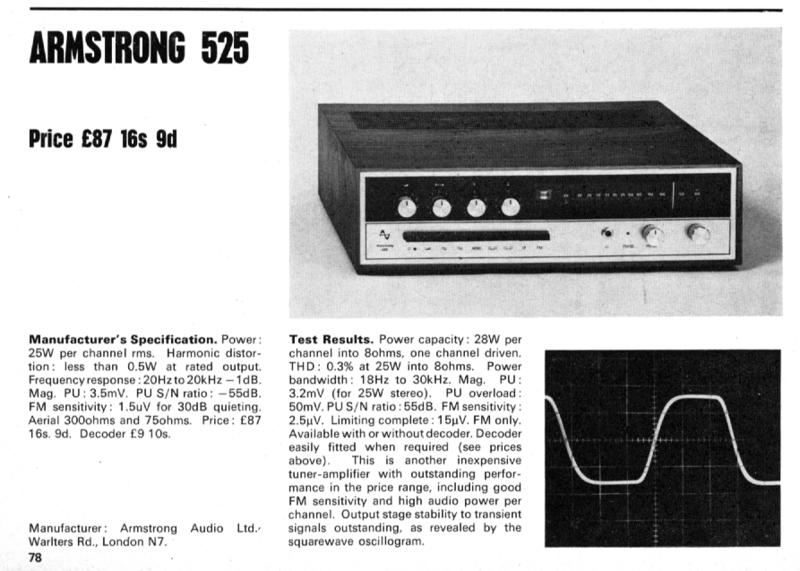 The 521 was the cheapest amplifier mentioned as “good value for money” so became the primary choice for many people wanting to put together their first stereo system. Sales rose dramatically! The rapid rise in demand for the 521 coincided with a change that was happening in the consumer goods retail market. Until the mid-1960’s the retailers tended to be specialist dealers. They usually offered a personal service advising and helping customers, and were often technically skilled as well as being audio enthusiasts themself. These retailers tended to become ‘franchised’ for given makes, and each established maker of audio equipment had their own set of franchised dealers around the UK who they felt would treat the customers well. However by 1970 a totally different approach to retail was growing rapidly. These were the ‘warehouse’ or ‘discount’ outlets. The biggest example of these at the time was ‘Comet’. These warehouses simply sold units in unopened boxes on the basis of offering a low price. It was assumed that the buyer preferred the lower price in exchange for having to make their own choices and be able to put together the items they bought into a stereo system. This approach was proving very popular with the increasing number of consumers who wanted a decent ‘stereo system’ that was as good as their neighbour’s. As a result the retail warehouses started to order 521’s in larger and larger quantities. At one point they were trying to order more sets than Armstrong could actually make. In addition, at one time Comet started selling the 521’s they obtained at a lower price than they paid Armstrong wholesale! At one point the director/owner of Comet visited Armstrong and said he wanted to buy the firm’s entire output, but at a lower wholesale price so he could cut his retail price still further. They were doing this because they realised that their customers tended come and to buy a system of associated items. So the amplifiers became what was known as a ‘loss leader’. The customers saw the low price for the 521 and came to the warehouse. Having chosen the 521 they then wanted loudspeakers, a record deck, etc. Since they were now in the retail warehouse they bought these other items there during the same visit. Hence the warehouse made its profits from the other items having drawn in the customers with the ‘bargain price’ 521. Nowdays this practice might be regarded as “predatory pricing” because smaller retailers wouldn’t have the resources to compete. But back then it was perfectly legal and regarded as acceptable. Alas, this presented a dilemma for Armstrong. It was great to be selling so many units, but they realised that if they agreed it might well kill off the many small specialist retailers. The result might then become a quasi-monopoly retailer. Consumers would lack choice and Armstrong would only have one dominating retailer who could virtually dictate terms. What then would happen when the ‘boom’ prompted by the 521 ended? So they decided to continue to supply their franchised dealers and sell the rest of what they could make to the warehouses. As a result, following the “Which?” survey the Armstrong 500 range was a best seller, but the sales were divided between the specialist franchise retailers and the warehouses. Unfortunately, I don’t currently have the details of the 524 tuner review so can’t comment on that at present beyond noting that the above indicates it appeared in the magazine as mentioned. However the above is interesting for the comment made on the driver transistors. The 521 continued to use Germanium AL102 transistors in the output stage of its power amplifiers. But Armstrong had a long tradition of ‘continuous development’. This meant that they tended to tweak or improve the circuity in their units to improve performance or reliability. This was generally done without any public announcements or change in model numbers, appearance of units, etc. So in general, sets made during that last period of manufacture might have been better than ones made near the start. They all met the initial specifications, but tended to exceed those specifications by a larger margin for later examples. The mention above shows an example of this. When the 400 range was designed and released, the available silicon transistors were not able to provide the required power output. And the 500 range was – electronically – similar to the 400 range, so inherited the same choice of transistors. But by mid 1970 better silicon transistors had become available which could be used to improve the performance of the 500 range. So they were incorporated into the sets. 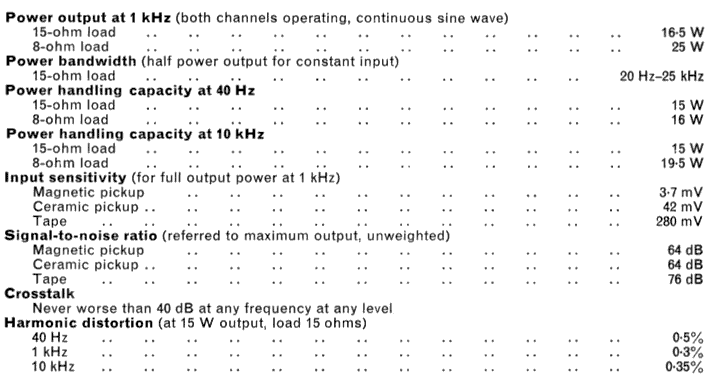 This review gave a very brief report on each of the ten tuner-amplifiers (receivers) included. The models compared were all in the price range from 76 to 188 UK Pounds. The units covered were: Heathkit AR-14, Armstrong 525, Lafayette LR-500-T, Pioneer SX440, Warfedale 100.1, Beomaster 3000, Trio TK-140X, Lux HQ555, Scott 3141, and Sony 6060FW. The only unit in the comparison which cost less than the 525 was the Heathkit AR-14 which had a lower technical specification – e.g. only 10 Watts per channel output power. The review does indicate that the Armstrong 500 range was seen at the time as being excellent value in terms of performance versus price.